The GIF's Geospatial Work space is located in 111 Mulford Hall. 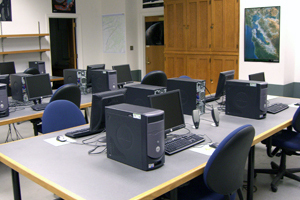 The space offers 13 workstation computers with geospatial software, a full-color letter-sized printer, a large-format plotter, a letter-sized scanner, and a conference room. Contact GIF staff to set up a user account. Detailed descriptions are available for the GIF's software and hardware resources. Events taking place in the 111 Mulford can be found on the GIF calendar. 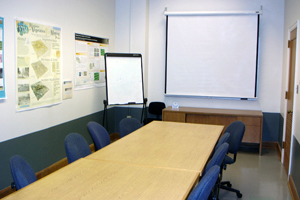 111 Mulford Hall also has a conference room available on a first-com/first-serve reservation basis. The GIF conference room is equipped for LCD projection, and is the site of our weekly Geolunch series. Contact GIF staff for room reservations. Use of the GIF workspace is available at no charge to UC students, faculty, and staff . Fees will apply for non-UC-affiliated users. Please read the GIF policies for details. The GIF helps to maintain the College of Natural Resources Teaching Lab, located in 124 Mulford Hall. 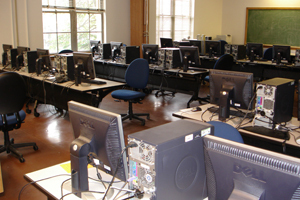 The space offers 30 computers with geospatial software, a black-and-white letter-sized printer, and a mounted projector for instruction. Events and classes taking place in the 124 Mulford can be found on the GIF calendar.